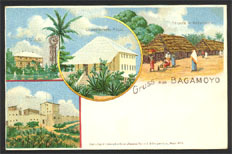 5738 ENT GERMAN EAST AFRICA (1893) Windmill*. Palm Tree*. Gorgeous multicolor printed to private order postal card (N) from Baygamoyo. Nice exhibit item!.